Keep your iPod music playlist safe at all times, use only the best FREE backup utility software for iPod to transfer music from iPod to computer instantly. They say music is the expression of our soul, it comforts, entertains and relays what we cannot utter by mouth. Truly, all of us treasure our music collection and would be devastated with just the mere thought of losing it. We can definitely help avoid the anxiety you will feel over losing your important information like your music files with the use of our Free iPad/iPhone/iPod to Computer Transfer program. This amazing free backup utility software works like a charm on all series of iPad, iPhone and iPod. 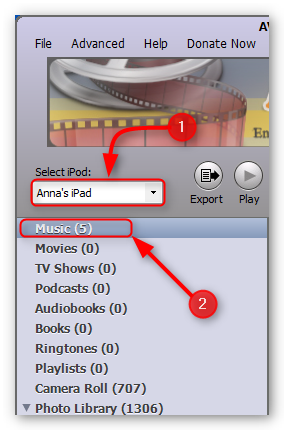 It can transfer music from iPod to computer easily and even faster than most paid backup utility software. It is very user-friendly, stable and most of all economical. As what our folks used to say, better to be safe than sorry, so download the AVGO Free iPad/iPhone/iPod to Computer Transfer program and transfer music from iPod to computer right away. 1. Launch “AVGO Free iPad/iPhone/iPod to Computer Transfer program” then plug in your iPod, then your device name will appear in the list. 2. Please select the field (Music/Movies/TV Shows/Podcasts/Audiobooks/Books/Ringtones) you want to backup. In the example below we chose “Music”. 3. 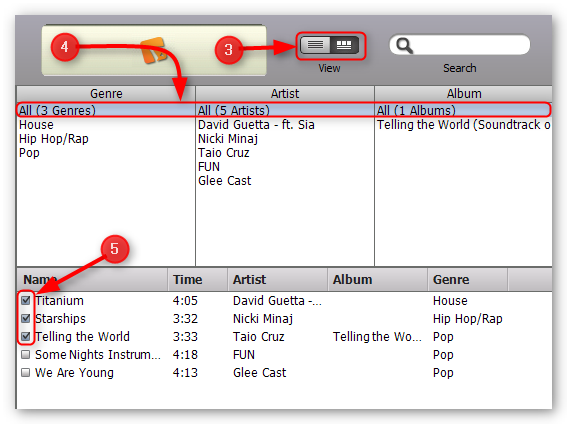 After selecting Music, all your music files will show up in the list on the right part of the software’s interface. You may also choose your viewing preference by clicking “View” from the selection button. 4. You may also filter out songs just like when you filter your music on Apple iTunes. 5. Please select the music you want to transfer by checking the box before it. 6. 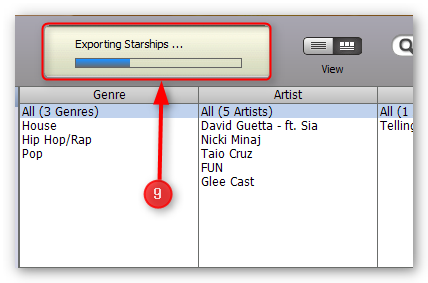 Next, click “export” to prepare the transfer process. 7. 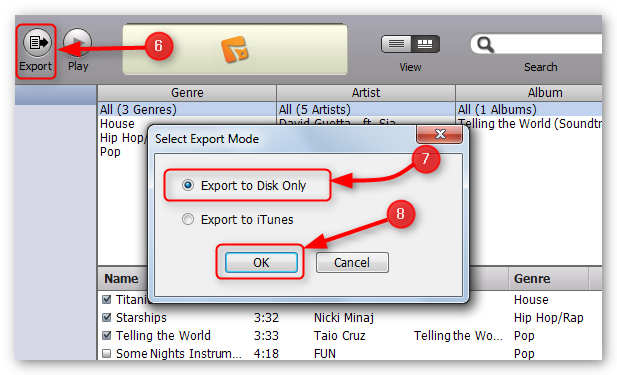 After you click “export” button the “Export Mode” dialog box will pop up, you may select where you want to store your files whether in iTunes or to your computer (disk). 8. Once your done selecting where you want to save your music files, just click “ok” and this will start the transfer of music from iPod to computer. 9. The progress of the transfer music from iPod to computer task can be seen in the status bar as shown in the picture below. 10. When the transfer of music from iPod to computer is done, another dialog box will pop up to give you an update on the transfer, as shown in the image. 11. 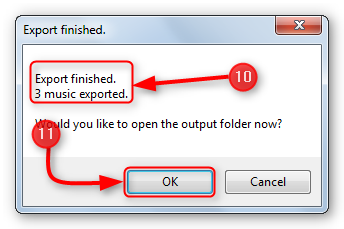 Lastly, just click “ok” then the output folder will automatically open and you may now start browsing your music files on your computer. Learn the easiest and fastest way to download video from YouTube,Hulu and any other website that has a YouTube or Hulu video embedded in it absolutely free. Currently, there are a number of video downloader software available for download in the cyber world but most of them are designed to grab videos from a specific site only, like some can only download from YouTube or from Hulu but AVGO Free Video Downloader allows you to download from either YouTube or Hulu and from any other website that has an embedded YouTube or Hulu video on it. As if it is not awesome enough that Free Video Downloader can download video, AVGO also threw in the ability to directly convert the video while it is being downloaded . That is two programs rolled into one and you can have it for FREE! 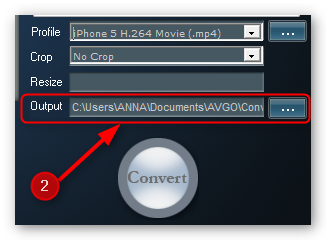 AVGO Free Video Downloader is quite easy to use as shown in the video and step by step guide below. 1. Copy (press CTRL + C) the URL of the YouTube, Hulu or wesbsite (that has YouTube or Hulu video embedded in it). 3. A dialog box will appear where you have to choose the video resolution. 4. Tick “Only download” if you don’t want to convert the video. 5. 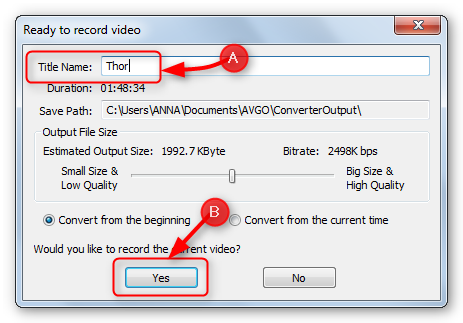 Tick “Convert to” if you want to directly convert the video that you want to download. 6. Should you choose to directly convert the video, click on the drop down box to select the video file format you require. 7. Click the “Download” button to proceed with the download. 8. You can check the progress of the download (and conversion) from the status bar as shown below. 9. 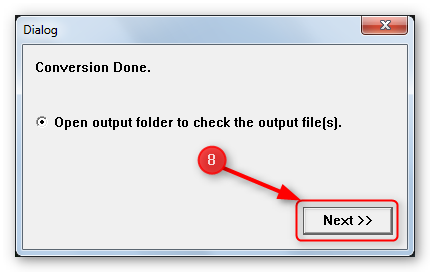 Once the process is finished, you may click on the small folder icon to open the output folder. 10. You may now play the downloaded (and converted) video from YouTube, Hulu and more. Convert videos for FREE with AVGO Free Video Converter, a powerful video converter that lets you convert any video format to a different video file format. The only constant thing in the world is changed and the same is true with technology. We now have a lot of portable devices to choose from and deciding which one to buy is not an easy task. One of the things we usually consider is the video playback feature, we need to check what are the video file formats that it can support. We at AVGO, love to make complex things simple for you, thus we give you AVGO Free Video Converter, a free video converter that allows you to convert video to any video file format you want. AVGO Free Video Converter is a very easy to use video converter that even beginners and non-techie will breeze through it. It offers a wide selection of output formats to choose from so you can convert videos to a file format to any device you may have and it does it for FREE! Launch AVGO Free Video Converter. 1. 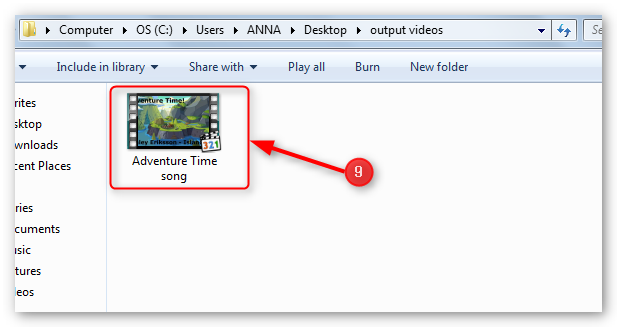 Click “Open File” from the interface to access the folder where the video you want to convert is located. 2. 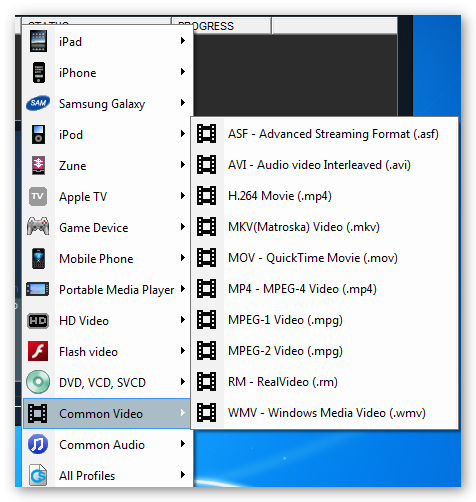 Choose the video file you want to convert. 3. 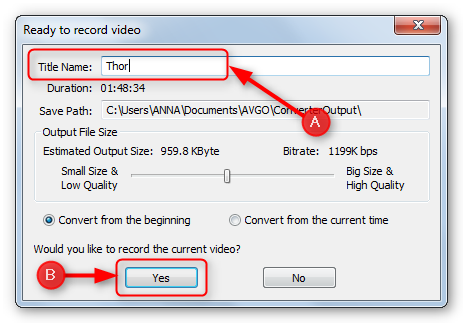 Click “Open” to add the video file to the converter program. 4. Choose the output format from the “Profile” drop down box. Once you click on the Profile drop down box, you will see several video file formats as shown below, choose the output format you require. 5. 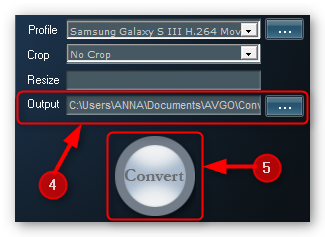 Set the output path to where you want your converted video file to be saved. 6. Click the “Convert” button to start the conversion. Note: To prevent the program from crashing, please make sure that the output folder is set to the main drive and not to any other drive or device. B) Lower portion of the interface below the convert button. 8. 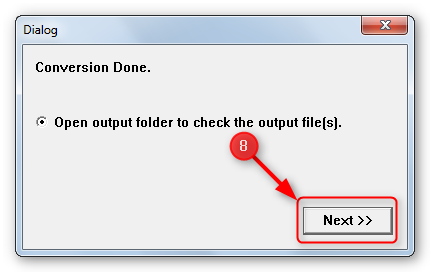 As soon as the conversion is done, you will get a dialog box where you may click “Next” to open the output folder. 9. From the output folder, you may now view the converted video file on your computer or transfer it to your device. Congratulations! 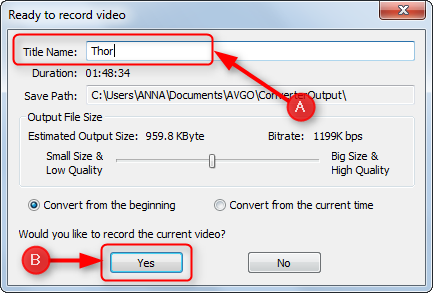 You can now convert video to any video file format you wish. AVGO Free DVD Ripper lets your rip DVD to iPad format for free so you can enjoy watching your favorite DVD movies on your tablet anytime you want. Since its release in 2010, iPad has dominated and still is the most popular and successful tablet in the market. Its versatility made it the top choice of tablet fanatics. Among its many features include video playback which allows users to watch videos and movies whenever they want. 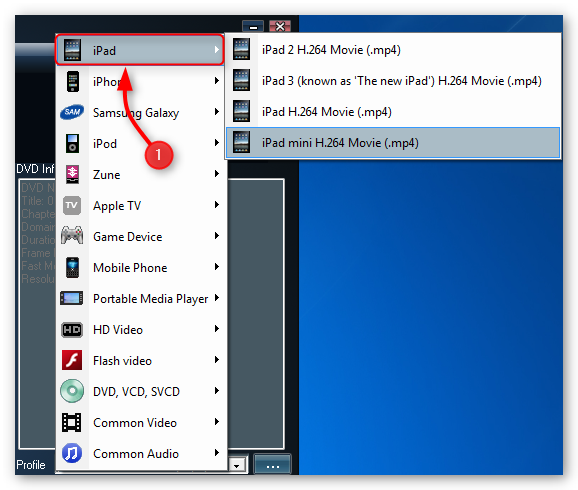 The said feature also transforms your iPad to a portable DVD player, all you need to do is convert DVD to iPad compatible format then Voilà, you can watch your DVD collection anytime you wish. 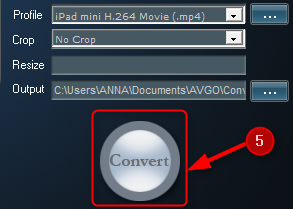 AVGO Free DVD Ripper Software does not only rip DVD to iPad format for FREE, it also provides you the ability to customize the settings (video size, video quality, output size, and more) to meet their requirements. Albeit it is a very powerful piece of software, you will find it quite fast, easy and simple to use as seen on the video and step by step tutorial below. Take advantage of this amazing opportunity, download AVGO Free DVD Ripper Software this instant and start watching your favorite DVDs on your iPad in a jiffy! You may set the output path of the converted file to any folder on your computer. Kindly click the “Convert” button to start the ripping process. B) After renaming the file, kindly click “yes” to continue the ripping process. The progress of the conversion can be seen at the bottom portion (status bar) of the interface as shown in the picture below. From the output folder, you need to move the output file to your iTunes then sync your iPad to transfer the converted file. 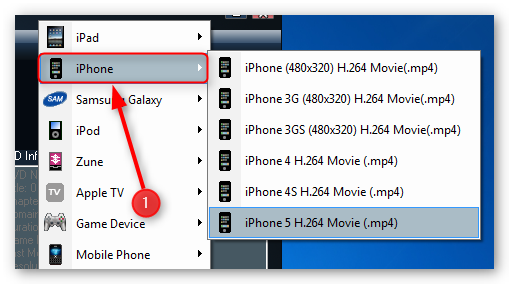 Transform your iPhone into a portable DVD player using a Free DVD Ripper Software that can rip DVD to iPhone compatible format. Converting your mobile device to an ultimate entertainment gadget is rather simple. To begin with, the program is very user-friendly which makes it absolutely perfect for beginners. Though it has a simple user interface, this amazing program has more to offer than just rip DVD to iPhone format. It gives you the power to customize the settings (video size, video quality, output format, etc.) to produce an output for your specific requirements. You just have to download and install AVGO Free DVD Ripper Software, a converter that can rip DVD to iPhone without burning a hole in your pocket because you can have it for FREE. From the output folder, you need to move the output file to your iTunes then sync your iPhone to transfer the converted file. Are you looking for the best FREE software that can convert your DVD to Android devices? AVGO Free DVD Ripper is absolutely what you need. More and more mobile devices and smartphones are making their debut in the market and most of it are running on Android operating system primarily because of it being an open source which allows manufacturers to freely modify and distribute it according to their preference. 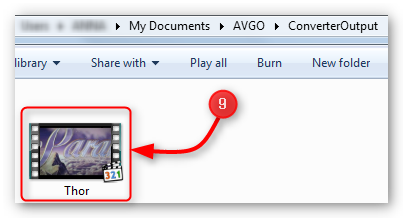 Just like the Android platform, AVGO Free DVD Ripper gives you the freedom to rip your DVD to Android format for Free! It also gives you the power to customize the output file (output file format, video size, etc.) to meet your requirements. Optimize the power of your Android device and download AVGO Free DVD Ripper now, the only free software you will ever need to convert all your DVD to Android format! On the left side of the interface, please click “Open DVD” to access the DVD you wish to rip. You may choose your corresponding Android device from the “Profile” drop down box. You may set the output path to any folder on your computer. Basically, this is where the converted file will be stored. You just need to click the “Convert” button to initiate the ripping process. From the output folder, you need to transfer the converted file to your Android device. For most Android devices, you just have to attach your device to your computer then “drag and drop” the converted file to your device. Finished! You may now start watching your favorite DVDs on your Android device.